Tickled To Tangle: "It's a String Thing" #208 - A Very Happy 4th Birthday! "It's a String Thing" #208 - A Very Happy 4th Birthday! It is also the two hundred eighth time we have met here to learn new tangles, renew aquaintences with old ones, and delve into creating tiles together with the same string in mind. Week after week, the inspiration is astounding. Thank you one and all for your creative and generous hearts. 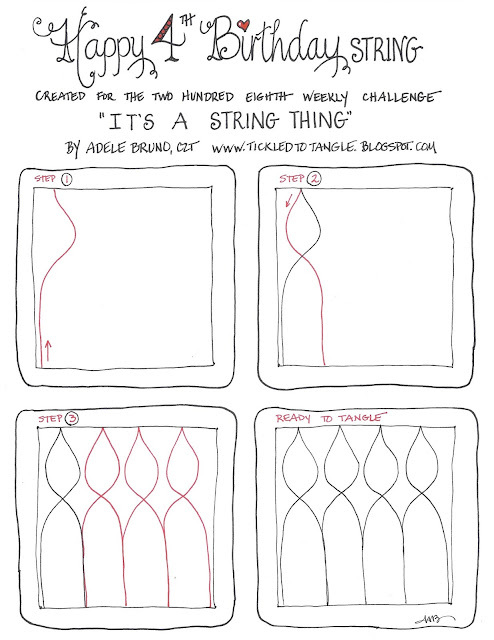 Above is an illustration of how to draw the string in one continuous line - one of my favorite things to do. My Tips for Tangling Knightsbridge can be found here.